Sitting with an Amish friend one afternoon, we made plans to take my truck up the road to visit his father. “Do you want me to drive?” asked my friend. I turned around and checked with his wife. “Can he drive?” “Well, he can” came her response. “I wasn’t asking about his ability, but for permission,” I clarified. Amish desserts. I actually ate a lot of ice cream this week. Summer time I guess. Coconut bars and a snitz fry pie as well. I have some Monster cookies waiting in the car. Maybe breakfast on my ride? Getting re-educated on the stars and planets by the son of an Amish friend. We were all sitting out by the fire after a delicious supper courtesy of his wife. I forgot what it is like to watch the stars (“stargaze”, I guess we call it) But that is just what we did (you see, their TV wasn’t working, har har). I was reminded of things like 93 million miles to the Sun. Eight minutes for its light to reach us. And one million Earths could fit inside. We are pretty small down here. Amish bent ‘n’ Dents. I’ve been to, I think 4 or 5 so far. A couple in Holmes/Wayne County, one in Ashland County, and another in Pennsylvania. Been buying lots of nuts and snack-type things (no eggs yet). The one I was in today, in New Wilmington, PA, sold pipes and cigars as well as food. That community is “lower”, which usually means less technology but more liberal on smoking. The four kids, ages seven to maybe a year, who flagged me down with green peppers, thrusting them in the air and waving them enthusiastically as I drove down their sleepy back road. It’s like they were lying in wait. Well, you know I just had to pull over and buy a bunch. It was like a tractor beam, those kids and their peppers. Hey, I used to be in sales. I appreciate the effort. And okay, it was pretty darn cute. Powerful salespeople, those little Amish kids. Hang on to your pocketbook. I am enjoying the comments very much. Hope to respond more when I slow down a bit. 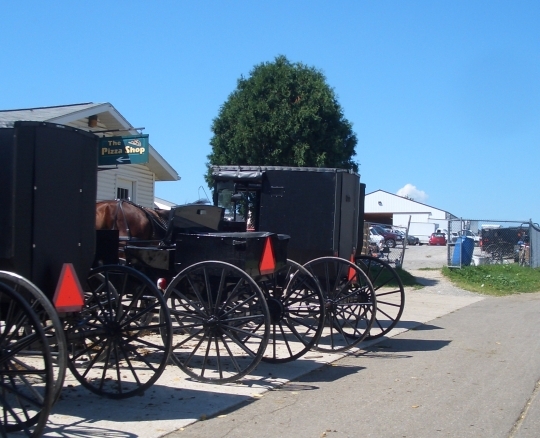 Here’s more on Amish Indiana, if you like. Great pictures, Erik. I love visiting in Holmes County. Glad you are having a wonderful time. Keep those pictures coming! Been to Shipshewanna, IN area a couple times. Nice there also. There is another Bent n Dent on Indiana State Road 119, north of Nappanee, west of Goshen. That one is Mennonite owned. I wish I could have your job!!! I would love to travel to all the different Communities too. and enjoy the people. Have fun on your journies. I was at the Mt. Hope Sale Barn on Wednesday Erik, I didn’t see you! LOL You should visit the produce auction down the road on Thursdays also. 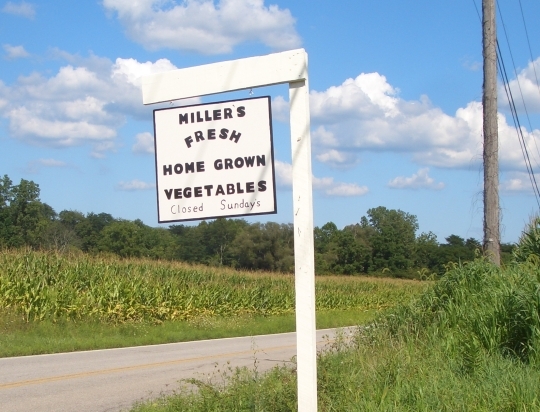 Glad you enjoyed your visit to our beautiful Holmes County Ohio. Magdalena, could I access your blog? Pick a peck o' peppers, I wish! Like Magdalena, my peppers are just starting to set fruit—what gives? Friends around my area have the same problem. Anyone know why? It was rainy, then hot, then hot & rainy, now cool/normal for about a week or two. Green peppers (raw) have been my favorite vegetable since childhood. I’d rather grow my own, since they’re VERY expensive at the store, but my luck’s run out the past 2 years (I grow from store-bought seed). I agree with Robin about wishing to have your job, Erik! I hope the weather holds for your trip through IN. A co-worker was in “Shipshy” last week, hitting flea markets (mostly non-Amish). I’ve got to get out more…and on the road! What a delight it must be to travel around to all of these Amish areas. Thank you so much for this site, and for everyone who adds something. I enjoy it so very much. Roberta, I feel the same way! If I could, I’d check it more often than I do! It’s so good to find a blog of like-minded people, being interested in Amish/plain lifestyles & such. It’s always a “treat” to log on and see what new comments/etc. are posted. Erik keeps us thinking & learning, alright! Enjoy Steuben county. I was there last weekend to visit my grandmother in Hamilton. I assume you will be in Hamilton, as the Amish community is right outside of there. When I grew up in Hamilton, the population was around 800. Now, it is over 1,000, as many of the lake homes have been annexed into the town. A friend of mine at our farmers market brings his little sister each week (she is around 6). She has her own garden and sells her produce (pepper and broccoli for 25 cents each) on a table beside her big brother. When she sells out, she wanders around and hangs out with the other vendors. My friend has mentioned that he needs to starting charging rent for other vendors benefiting from his sister’s cuteness. I hope that we can talk you into coming on west and visit the wonderful settlements in Arthur and Kalona as well the other Iowa/Illinois settlements. Would love to Lowell. Though I’m afraid on this trip, the closest I’ll get is what happened last night. I went out to eat with some friends in northern Indiana. One of the ladies is from Arthur originally. When she asked me who I remembered from my time there in 2004, I spat out the first name that popped into my head. Turned out the guy I named was…her brother. Oh, I go to Mt. Hope Auction quite often when I am visiting family up there – get there about once a year to Holmes County, but make Mt. Hope Auction visits frequently when there. Making me homesick!!!! Although Erik’s initial entry is not about books, I didn’t know were else to post this, so, the most recent posting will have to be acceptable to all. I was recently viewing a Quaker website that I like, and noticed that they had posted a catalogue list of books that may be of interest to readers of Amish America. If you want to visit the website, google it, it’s called “Quaker Jane”, and a like to her choice of books are found under the heading “Updates” and I’m referring to the entry for “Eighth Month:”. I think some of the Amish/Mennonite themed books might be interesting for people around here to read. If you’ve read some of them already, that’s neat too. I thought I’d share. Oh- and just driving down to Topeka (just off of highway 5) and tooling around is interesting. Typically lots of people out and about and some interesting stores to poke around in. And there’s the sale barn…where my dad hangs out from time to time!